I have been growing horseradish (Armoracia rusticana) on and off for many years now. 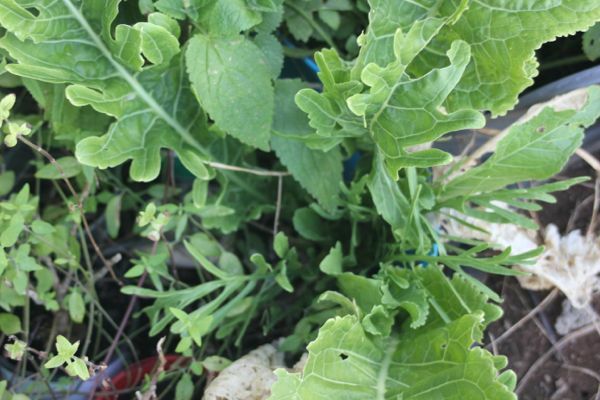 It is an interesting perennial vegetable that is worth growing. The young leaves can be eaten but it is the pungent roots that are the real crop here. Horseradish has been grown as food and medicine for centuries. Being a brassica, horseradish can suffer from cabbage white butterfly. Other than that it does not seem to suffer from many pests. There are a few diseases that are said to bother horseradish, but I have never seen these diseases and am not sure if we have them in Australia. Horseradish can flower. Many people tell me that it can't, but mine does. Mine doesn't flower each year though. In order for horseradish to flower it appears to need to be a large plant that was not disturbed the previous year. If you grow horseradish from a root cutting it normally isn't large enough to flower the first year. If the plant is large enough and has been undisturbed the previous year it also seems to need reasonably fertile soil. Horseradish will survive in poor soils, but to flower it seems to need fertile and well drained soil. After that water it well, and you are well on your way. 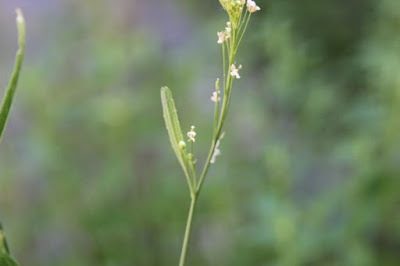 The first sign that a large plant will flower is that they send up normal leaves, then the plant sends up dissected leaves as seen in the first picture above. Then if you are lucky it will send up a flower stalk that looks like any other brassica flower stalk. 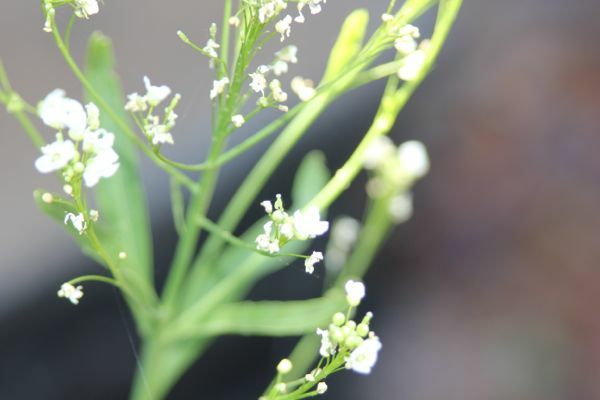 The flowers have the same shape as any other brassica flower. 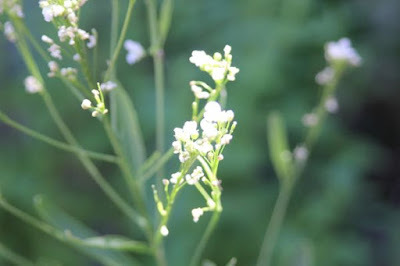 Horseradish flowers are white and tiny. I have been told that horseradish is sterile, or that it is self infertile, or that for horseradish to set seed you need two different varieties flowering at the same time. I am not sure if any of this is correct. Brassicas are often said to be self infertile and need several plants in order to set seed, yet I have grown brassicas from a single seed. Sure many flowers aborted, but some produced viable seed. The resultant seedlings were vigorous and displayed enough genetic diversity that they could cross with one another and produce plenty of seed. Admittedly this was not ideal, but I doubt that growing horseradish from seed is ideal in any way. Most people recommend removing flowers from horseradish. Many of these people have either never seen horseradish flowering or they don't have a reason why the flowers need to be removed, so I tend to ignore their advice. Horseradish has been grown from seed in the past. I have done some reading about horseradish that has been grown from seed, in general it has not been simple. Some people have successfully planted and grown horseradish seeds with no problems, but most seed grown horseradish seems to be done through embryo rescue technique. I left my horseradish flowers to see what would happen. Many of the early flowers aborted. I started to consider ways to overcome self infertility with such tiny flowers. Then I noticed tiny seed pods started to develop. Once it started the plant produced quite a few seed pods. I left the seed pods, they developed little bumps indicating that tiny seeds were inside. Eventually the flower stalks started to dry off. I figured this was much like any brassica and that the seed pods would shatter once dry so I bagged a few so I didn't lose them. As expected the seed pods shattered when dry enough. I collected the tiny seeds in the bags and have no idea what happened to any un-bagged seed. The seeds were really tiny. Some of the collected seeds didn't look viable, they were light in colour and shriveled. Some other seeds were darky and plump. These seeds looked viable. Being so small I figured they would not be viable for long, so I planted them all. 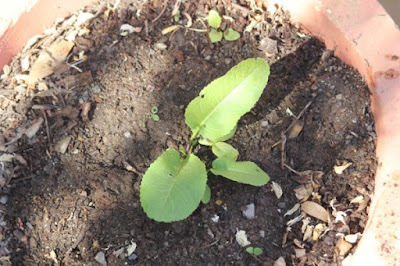 I planted these seeds into a pot of moist soil that I had in an ice cream container. Then it rained a whole lot and the pot was submerged for a fair while before I noticed. Unfortunately nothing came of my horseradish seeds. Perhaps they drowned, perhaps they floated away, or were eaten by something, or could not germinate, I don't know. I am not sure if any of my tiny seeds ever would have germinated. In hind sight even if they did germinate I had not protected them from snails and things so likely would have lost them all. I wish I looked after the seeds better. I like learning things. If nothing else I would have learned a lot and I would have a reasonable idea if I was going to be able to grow horseradish from seed. This past summer my plants were all too small to flower as I had disturbed them over the last winter and harvested roots. This winter I have a plant that I am not going to disturb. Perhaps next summer I will have more horseradish flowers. If so I will give growing horseradish from seed another try. I could try to get another clone so I have two different varieties and see if that helps seed set. Horseradish varieties are mostly unnamed in Australia so it would be difficult to know if I found another clone or just got another plant from the same clone. I know there is a variegated form around, which would probably be a different clone to the one I am growing, but getting one of those is proving difficult. I don't really have any reason to grow horseradish from seed other than to see if I can. 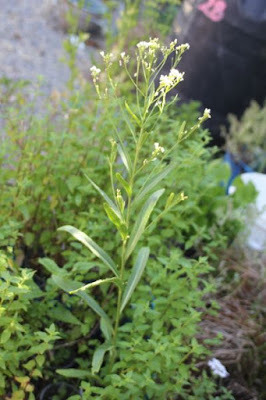 It is not a vitally important crop and I don't have any real breeding plans for it other than to see what will happen. So if it turns out that the seeds can't germinate without help I have no intention of attempting embryo rescue technique. Even though it is simple to grow, horseradish plants seem to be difficult to find in Australia for some reason. I grow horseradish and I sell root cuttings over winter and small plants over summer along with a few other perennial vegetables. If you are interested they are listed on my for sale page.